Designed by Louisiana tournament anglers for fishing shallow cover with heavy line, the "Cajun Steamer" Heavy Cover Flipping Jig is perfect for any shallow water or suspended brush pile scenarios whether it’s grass, wood, rocks or docks. The Cajun Steamers slender head design, complete with hand-painted, glitter infused finishes, was specifically designed to help it slip through the thickest cover and also for skipping docks. Available in several tournament inspired colors, the Cajun Tackle House "Cajun Steamer" Flipping Jig is also equipped with a premium 5/0 Mustad heavy wire, round bend hook for a greater hook up ratio and the strength to pull fish out of cover. Every Cajun Steamer Flipping Jig is built by hand & designed to put more fish in your boat! As with all of our Cajun Tackle House products, if you need Cajun Steamer Jigs in additional sizes or with a different blade color and/ or skirt combination, please feel free to contact us and we can build it to your requirements. 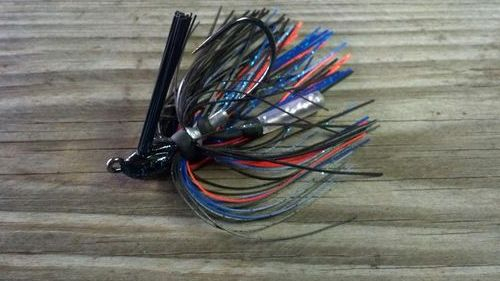 3/8oz Black/Blue Cajun Steamer Jig........................................ $4.50 ea. 3/8oz Black Neon/Chart. Cajun Steamer Jig................ $4.50 ea. 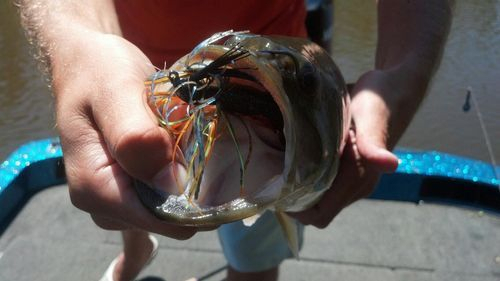 3/8oz "BJ Special" Cajun Steamer Jig....................................... $4.50 ea. 3/8oz Junebug Cajun Steamer Jig................................................... $4.50 ea..
3/8oz Okeechobee Craw Cajun Steamer Jig................ $4.50 ea. 3/8oz Watermelon Candy Cajun Steamer Jig................ $4.50 ea. 3/8oz Spring Perch Cajun Steamer Jig.................................. $4.50 ea. Orders may be placed by phone by calling (985) 688-2273 or by email at cajuntacklehouse.com . You can also place an order through the "contact us" link on this website. As always, we welcome custom sizes and colors. Credit/Debit payments accepted.